KEY FACTS: Isaac Newton was born in Lincolnshire, England. His mother removed him from school when he was about 17yrs old and attempted to make a farmer of him. 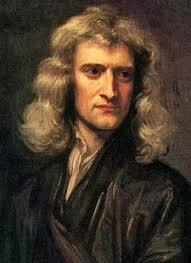 However, Newton hated farming and instead managed to get back into school where he became one of the top students. He studied at Cambridge University and went on to become a fellow there. During his lifetime, Newton made many advancements to scientific thinking. He developed the theory of gravity, the laws of motion, a new type of mathematics called calculus and advanced the field of optics through his observations with a reflecting telescope. ACHIEVEMENTS: He is recognised as one of the most influential scientists of all time. His most important piece of work was called Philosophiae Naturalis Principia Mathematica (mathematical principals of modern philosophy).